"Many bodies were found along the shoreline because of the tsunami, but the numbers are still unknown," Sutopo Purwo Nugroho, a spokesman for the agency, told Reuters. "When the threat arose yesterday, people were still doing their activities on the beach and did not immediately run and they became victims," he told a news briefing. Some survived by climbing 6m (18ft) trees to escape the huge waves, the spokesman said. The city's main hospital was damaged in the quake, and TV footage showed dozens of injured people being treated outside in makeshift medical tents. Palu and Donggala are home to more than 600,000 people. President Joko Widodo said troops were en route to the area to reinforce rescue teams and help retrieve bodies. The country's military is sending cargo planes of relief aid from the capital, Jakarta. Officials are urging locals not to enter their homes and to sleep away from buildings, due to the risk of aftershocks. The earthquake hit just off central Sulawesi at a depth of 10km (6.2 miles) just before 18:00 on Friday (10:00 GMT), the US Geological Survey said. A tsunami warning was issued, but lifted within the hour. Indonesia's meteorological agency has been criticised for its response, but officials said the waves struck while the warning was in place. 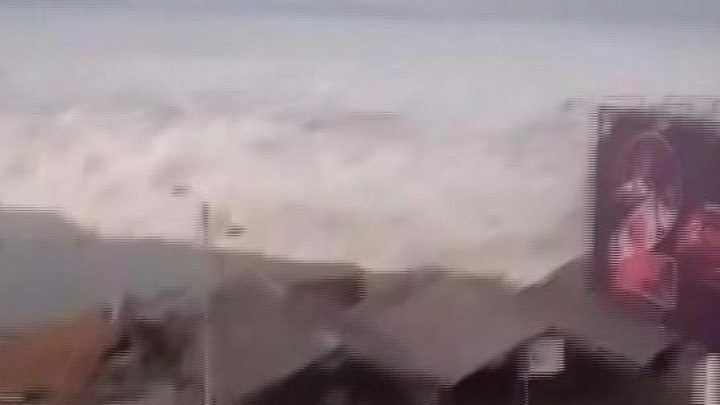 Dramatic video of the tsunami hitting Palu shows the high waves sweeping away several buildings and then the large tilted mosque in the town, about 80km from the quake's epicentre. "The situation is chaotic, people are running on the streets and buildings collapsed. There is a ship washed ashore," said Dwikorita Karnawati, head of Indonesia's meteorology and geophysics agency.